A few months ago, our cousins said “Why don't you come down to NC this autumn & we’ll go camping for 4 or 5 days in the mountains at Julian Price on the Blue Ridge where we camped as kids.” “Sounds great!” we replied, that is, until we found out there were no hookups and realized we would never make it beyond a day or two with the standard group 24 marine battery as our only power source. 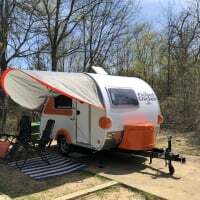 In our entire first year of [email protected] ownership we had enjoyed staying in 9 different campgrounds, mostly state parks but all with hookups, and we never even made it out of Virginia. That's when I began thinking & reading more seriously about a new battery & a solar panel. 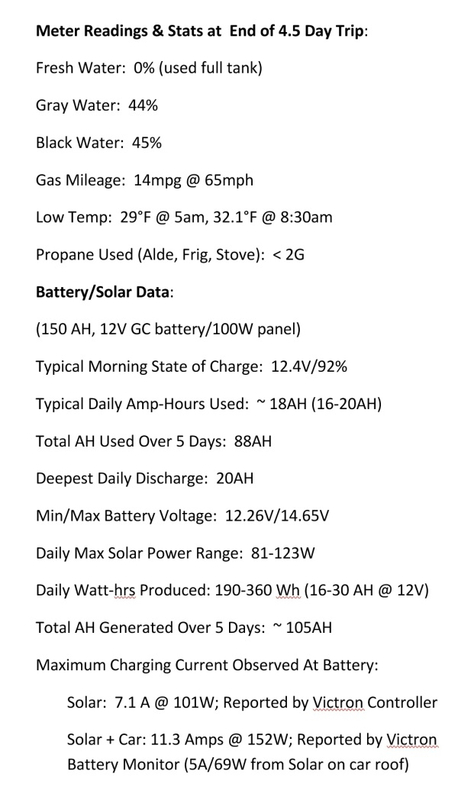 After lots of forum study, searching & reading what experienced boondockers had to say, and thinking about our own needs, we decided to get a single 150AH 12V golf cart battery, a 100W solar panel, smart solar charge controller and a smart battery monitor. I spent the next couple of months getting these modifications installed, as I have previously documented (see links at bottom). 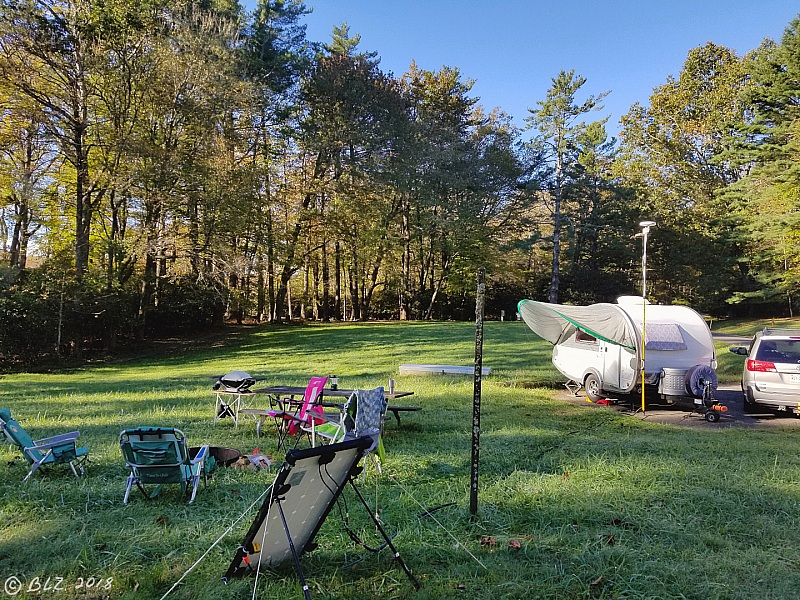 I am happy to now report that our first boondocking* trip was a complete success, and thanks to our cousins, we had this beautiful site with good sun to try out our solar panel for the first time. My careful preparations paid off nicely, and if anything, we may have been a bit overly prepared with some things, but I'm totally okay with that! Site photos from the trip have been posted (link at bottom), but before I forget, here are some notes & stats I gathered for future reference that I found interesting – some from the Victron monitoring devices & apps, and others from my own observations..
Also, here are a few screens from the Victron Solar app that I found interesting & helpful, as the solar & battery status was relayed wirelessly in real time to my phone via bluetooth.. The solar panel can actually exceed the rated wattage! Nice to be able to see a daily solar & battery history of how we were doing with power generation. When I first saw this on the Battery Monitor app, I wondered how I could be generating 152W from a 100W panel, but then realized I snapped this screenshot just before heading home when it was mounted on the car, which was contributing amps too. The 18AH consumed was probably a typical day’s usage. I like how the battery history page shows at upper right the Amp-Hours used since the last charge cycle, and below that the total used for the trip. We were fortunate to have mostly sunny days with temps mostly in the 40’s and 50’s, but ranging from upper 20’s to lower 60’s, with only about 4-5 hours at or below freezing during the last night. One afternoon was totally overcast, and another day was sun & clouds mixed, but good sun otherwise, and we managed to recharge every day within a few hours or less. This screenshot is from the day before we left, which was not the coldest, but you can see the battery monitor was reporting 37° from the sensor on the battery at 8:37am. That info, along with voltage is shared with the Solar Charge Controller via bluetooth network, so the two devices share information such that charging parameters can be adjusted & compensated for temperature changes. A cold front blew through one night, with 40+mph wind gusts, but the solar panel with tie-downs remained solidly in place on the ground for the duration of our stay. We kept it facing south at 36° angle (our latitude at the park) The solar panel also survived travel on the roof of our Sienna van & remained solidly in place, as did the cables connected to the rear and to the trailer at its connection on the tongue & to the charge controller in the battery tub. The only issue we had with high winds was not having our Pahaque visor tied down to the ground, resulting in it flipping up above the roof and banging into the antenna pole, but nothing was broken or disturbed other than our sleep, because it was a bit noisy. We thought having the tie downs wrapped around the stabilizers would prevent this, but it did not. We used less than half a tank of propane, which was what we started with, to run the Alde, frig, and stove. I almost changed the tank before the last night when freezing temps were expected & the pressure gauge showed in the low zone, but knowing I had an adapter to easily connect a 1-lb canister if needed during the night, I left it on. Conveniently, it ran out during the drive home the next day with just the frig running. I had a spare 20-lb tank, but we didn't need it. I also brought an extra 6-gal tank for dumping excess gray water, but we didn't even fill the gray tank half way. We also didn't need the 5-gal fresh water tank & water pump to add water, as we never ran out, but the SeeLevel showed we had zero remaining. Beginners luck! All things considered, we were very happy with the performance of our battery and solar panel, as well as our good fortune with propane, holding tanks, and surviving both freezing temperatures & high winds (which both happened at night while our Alde kept us nice & warm). The daytime temps & abundant sunshine made for a pleasant trip. Special thanks to @JKJenn Grover for “jump-starting” my battery education (her pun, not mine), and the many others here whose ideas & contributions on this forum made it possible for us to expand our adventures. It's a real testament to the collective knowledge power of this forum (or is that “power knowledge”?). In any case, if you've made it this far, thanks for listening, and I hope some of this will help someone at some point. Great post! We just “downsized” from a class C to a 320 cs-s and have been so much happier. We are looking to do some NP camping this summer, so this post gives me a lot to consider. Welcome @PickledChicken! Enjoy your TaB and the forum! @PickledChicken, welcome. LOVE that! PickledChicken. Should we pass you on the road some day, we'll be the crazies, waving! Adventures await. Happy [email protected]! Glad you found it useful, @PickledChicken, and congrats on downsizing to a 320! where you'll find a recent article on "How Much Solar Do I Need?" and many others. I learned most of what I know on this topic from her. Thank you @BrianZ for the helpful tip. Headed over to Jenn Grover's site now!! I missed this...October was a busy month...awesome wrote up! Glad everything worked out so well for you! Thanks, @WilliamA! Glad you found it useful. Thank you, @jkjenn Jenn, especially for passing along your knowledge & experience, which has paid off nicely for me. @BrianZ Thanks to you and @jkjenn for all of this helpful advice. I am not quite ready to do the solar mod on my 320, but I know I will have tons of valuable information from the two of you when I am ready. I've always been a little skittish about doing any mods that entail messing with electricity and power. This makes me feel so much better. And @jkjenn, I'm looking forward to seeing your new solar setup at üCamp19 if you have it done the week before.